Let JR-Tech show you how a cloud migration can revitalize your business, keep your TCO (total cost of ownership) low, and improve the reliability of your systems. Although ‘The Cloud’ has become quite a buzzword lately, few know how to fully implement it into business, and fewer know how it actually works. Full transition to the cloud is not for every business, but most businesses can leverage individual Cloud services (i.e. email, scheduling, ERP, phone service, CRM, accounting, backups, file sharing, databases, & office suites) to meet their needs and technology goals. 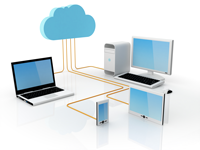 JR-Tech develops Cloud Migration strategy that is customized for each business. We’ll help you understand your Cloud migration options, the total costs associated with migration, the impact on operations both on and off-site, and develop the right migration path for your business.